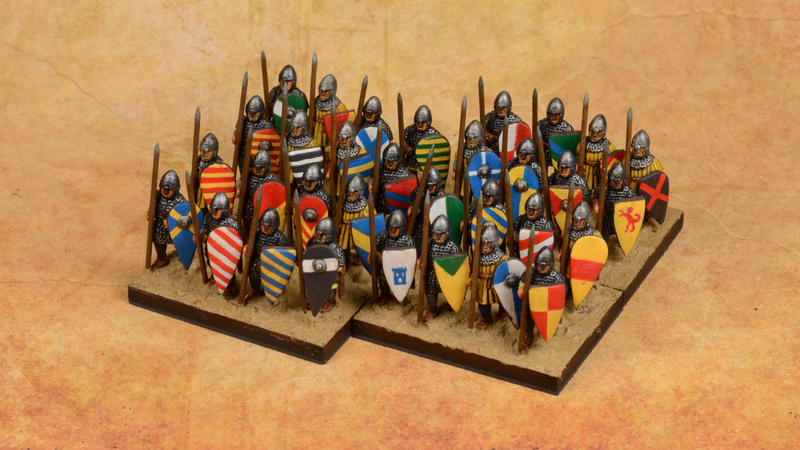 A while back, I thought that a dedicated paint & modelling tray would be a good way to reduce some of the clutter on my hobby table and looked at the available commercial products. 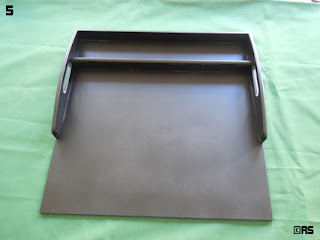 While there are plenty of choices out there (some of them pretty good), they tend to be a tad expensive for a souped up tray, especially if you have to factor in shipping. Besides the price, I found that the main drawback of commercial paint stations or tray was the lack of flexibility: water goes here, paints and tools here and that's it. 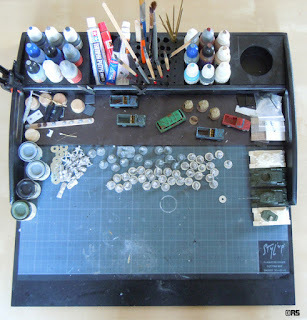 So I decided to make my own, trawled the forums to get some inspiration from other DIY paint tray and found one which came close to what I wanted on Dakka Dakka. 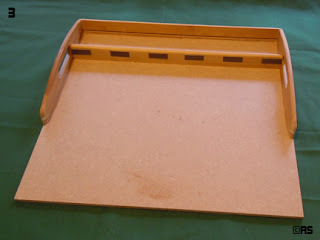 Being something of a cheapo at times, I then headed over to the local equivalent of a dollar store to pick up a tray for conversion. What I found was a cheap bamboo tray that set me back something like 4-5 euros, was the right size (roughly 30 by 45 cm) and, best of all, had a bottom piece that was easily removed. 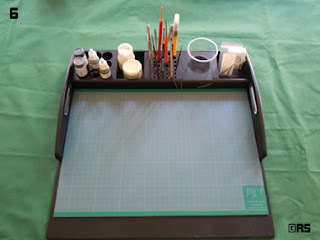 Turning it into a paint station was dead simple and even my very limited woodworking skills were sufficient. 1. 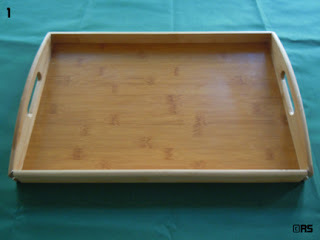 The bamboo tray as it was purchased (actually the front has already been knocked out). 2. Front piece trimmed to fit inside the frame and bottom piece removed (this was easy as it was simply a piece of 3mm MDF that slid into grooves cut into the frame with no glue involved). 3. 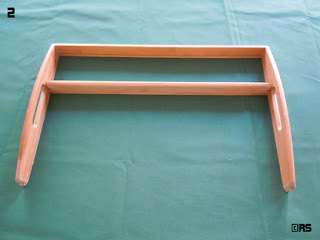 Frame and front piece glued on top of a 45 cm square piece of 5 mm MDF. The width of the tools area was sized to fit some MDF offcuts I had lying around and thin metal bases were glued to hold drill bits and scalpel blades with the help of magnets. 4. 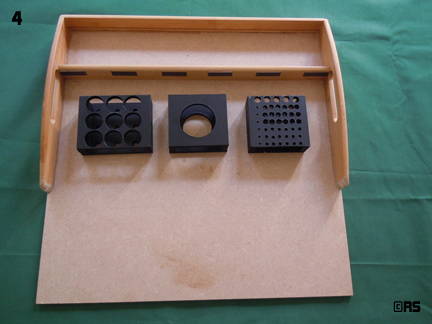 Paint, water and tools holders made from 5 mm MDF offcuts drilled to suit and 20 mm spacers. These I made separate so I can reposition them or leave them out as needed. 5. The whole lot spray painted black. 6. The tray finished off with a trimmed cutting mat. In addition, since the bottom piece could still fit into the grooves which lined the inside sides of the tray, it was trimmed and covered with magnetic rubber to have a removeable area to store figures in progress (see above). This cost a fraction of the cost of a commercial paint station, suits my needs perfectly and it took less time to make than to figure out what I wanted. After a year's use, my hobby table is still as cluttered as it was before but the main difference is that I can easily move whatever I'm working on out of the way in order to sort out the mess when it becomes unmanageable. With hindsight, I would dispense with the block for holding paint bottles: I use it because it's there but it is just as simple to slide the other two blocks around to create the necessary space as you can see in the header photo.